Saturn was the most distant of the five planets known to the ancient skywatchers. In 1610, the Italian astronomer Galileo Galilei was the first to gaze at Saturn through a telescope. Much to his surprise, he saw a pair of objects on either side of the planet. He sketched them as separate spheres and wrote that Saturn appeared to be a triple-bodied planet. In 1659, the Dutch astronomer Christiaan Huygens, using a more powerful telescope than Galileo's, proposed that Saturn was surrounded by a thin, flat ring. In 1675, the Italian-born astronomer Jean-Dominique Cassini discovered a "division" between what are now called the A and B rings. It is now known that the gravitational influence of Saturn's moon Mimas is responsible for the Cassini Division, which is 3,000 miles (4,800 kilometers) wide. Saturn's ring system is the most extensive and complex in the solar system, extending hundreds of thousands of kilometers from the planet. In the early 1980s, NASA's two Voyager spacecraft revealed that Saturn's rings are made mostly of water ice. They also found "braided" rings, ringlets, and "spokes," dark features in the rings that circle the planet at different rates from that of the surrounding ring material. Material in the rings ranges in size from a few micrometers to several tens of meters. Two of Saturn's small moons orbit within gaps in the main rings. Though Saturn's magnetic field is not as huge as Jupiter's, it is still 578 times as powerful as Earth's. Saturn, the rings, and many of the satellites lie totally within Saturn's enormous magnetosphere, the region of space in which the behavior of electrically charged particles is influenced more by Saturn's magnetic field than by the solar wind. Hubble Space Telescope images show that Saturn's polar regions have aurorae similar to Earth's. Aurorae occur when charged particles spiral into a planet's atmosphere along magnetic field lines. 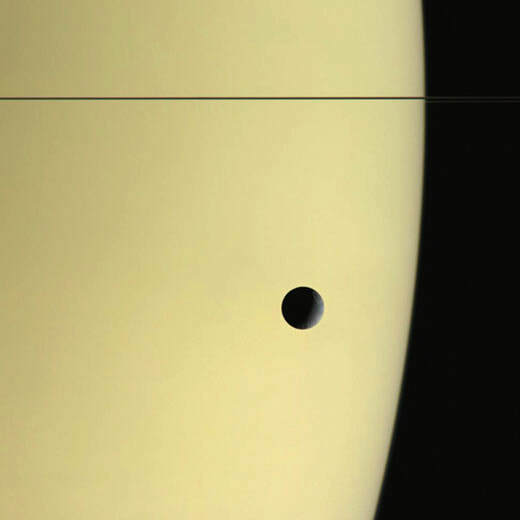 Voyagers 1 and 2 flew by and photographed Saturn in 1981. The next chapter in our knowledge of Saturn is under way, as the Cassini- Huygens spacecraft continues its exploration of the Saturn system. The Huygens probe descended through Titan's atmosphere in January 2005, collecting data on the atmosphere and surface. Cassini will orbit Saturn more than 70 times during a four-year study of the planet and its moons, rings, and magnetosphere. Cassini-Huygens is sponsored by NASA, the European Space Agency, and the Italian Space Agency. Saturn is a gaseous giant planet named after the Roman god of the harvest. Its thick atmosphere is mostly comprised of hydrogen and helium. It may also have a rocky core, not much bigger than Earth. Saturn is known for its unique rings. Like Jupiter, it has bands of clouds and swirling storms, although they are not as obvious as Jupiter’s because the top of the deep atmosphere is hazier. If you look carefully at the image below, you will see the bands of clouds and swirling storms. Saturn's axis is tilted, just like Earth's axis, and so it has seasons, just like Earth. 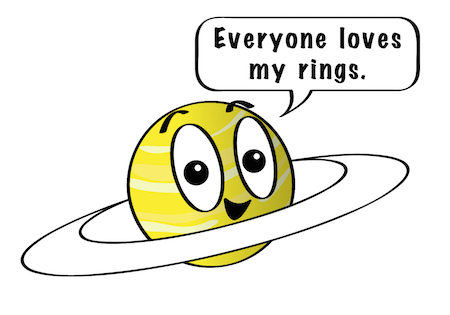 All four of the gas giant planets in our Solar System have rings, but Saturn’s rings are the biggest and brightest. Saturn’s rings are comprised of countless particles of ice, along with a small amount of ice-covered rock. Ice is very reflective and that's why Saturn's rings are so bright. The icy particles in the rings range in size from a grain of sand to the size of a house. These icy particles are probably pieces of a frozen moon that was ripped apart by Saturn's immense gravity, after the moon got too close to Saturn or perhaps the icy particles in the rings are the remains of a moon that was smashed to pieces long ago after colliding with another moon. ​◀ Saturn’s rings are wide, but thin. You can see the rings through a small telescope. When we look at the rings edge-on, they almost disappear because they’re so thin. In this photograph, the rings appear as a thin dark line. You can also see Tethys - one of Saturn's many moons - in the photograph. 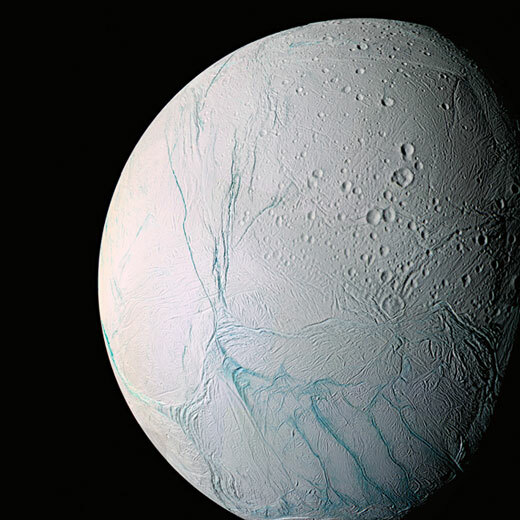 ​Enceladus is the sixth-largest moon of Saturn. This icy moon has a global ocean hidden beneath its icy crust. Fountains of water vapour and ice particles burst through cracks in the ice, which then coat Enceladus with fresh layers of ice. This ice eventually buries some of the ancient impact craters. ​The icy moon Mimas has a lot of craters, including one giant crater that was made by an object so big, it nearly shattered Mimas. 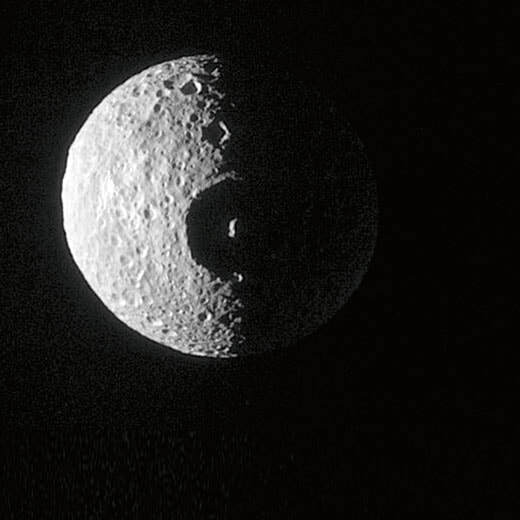 This crater sort of makes Mimas look like the "Death Star" from Star Wars. Mimas is a small moon, with a diameter of just 396 kilometres, making it the smallest astronomical body known to be rounded into shape because of self-gravitation. 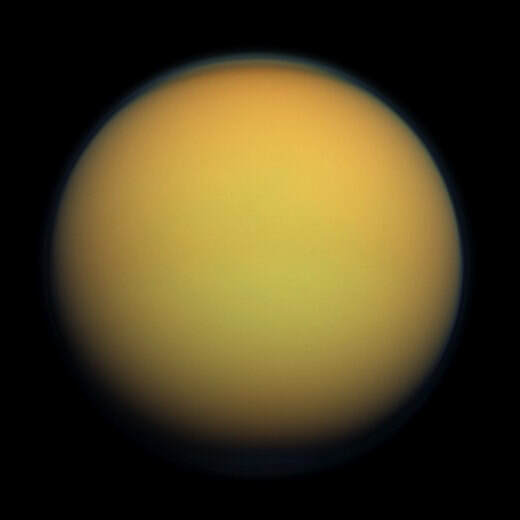 ​Titan is the largest moon of Saturn. It's also the only moon in the Solar System with a dense planet-like atmosphere and clouds. Its thick atmosphere is made mostly of nitrogen, along with some hydrocarbons, which makes it a smoggy atmosphere. Titan has rivers and lakes of liquid methane. 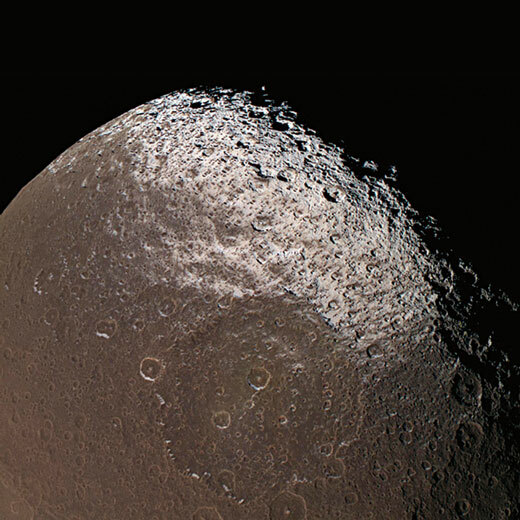 ​Iapetus is the third-largest moon of Saturn, with a diameter of 1468 kilometres. It was discovered on October 25, 1671, by Giovanni Cassini. Iapetus is sometimes referred to as Saturn's two-face moon because one-half is as dark as charcoal, while the other half is as bright as snow. 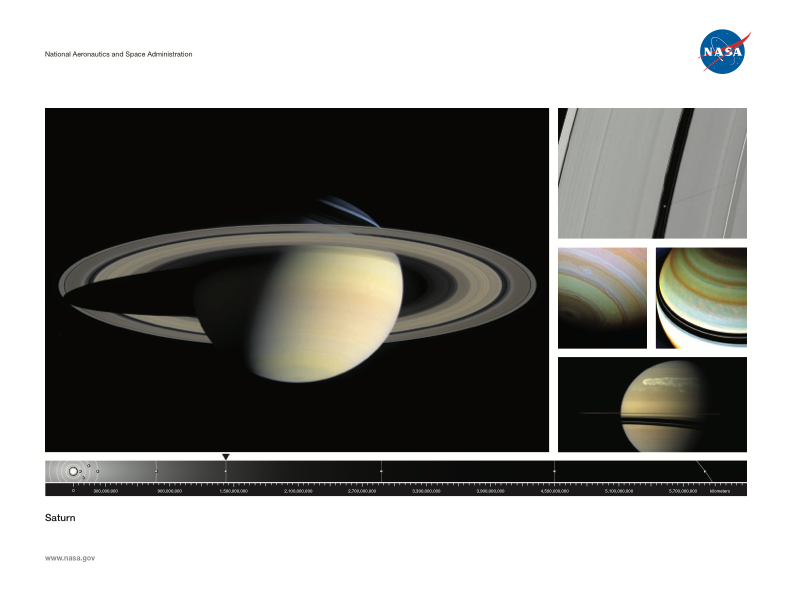 Click on the image below to download the Saturn lithograph and learn more about this planet.